"lost in the new dark ages"
Chronos Chronicles is about a woman, a likely hero. Chronos finds herself in middle America some 100 years after a nuclear war. What has happened to the United States of America, what has happened to the Earth? Chronos is going to find out what happened. In this new time she must make her way with all of the new skills and technology that she has been given. Through this changing place, she knows that someone or something is guiding her. She has free will, but there is a something that wants her here. The universe is on her side. Follow her adventures as she makes her way across the landscape of the strange, the familiar. Creating chaos to save the day. Chronos Chronicles has not been tagged yet. 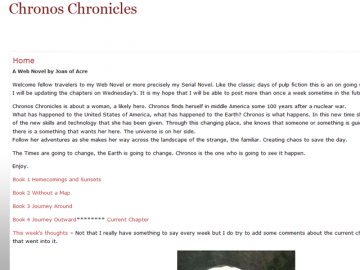 Help others find Chronos Chronicles by tagging it! Chronos Chronicles has not been reviewed yet. Chronos Chronicles has not been recommended yet.